Its a much different process getting infusion at the hospital (the infusion center couldn’t accommodate since my week got pushed). The morning begins waiting for the hospital to call to say they have a room available. As luck would have it, they called at 8am. Arrived by 9, but hit the first wall: doc’s orders weren’t in the system and we had to wait for those to arrive before anything could begin. At this point, I’ll be starting around noon. Which means probably finishing by 5 or so. I’m pretty nauseous already from yesterday’s treatment, so we’ll see how the addition of the cisplatin adds to that. Other than that, I’m resting comfortably! Thinking of you friend!! I so love your outlook!! 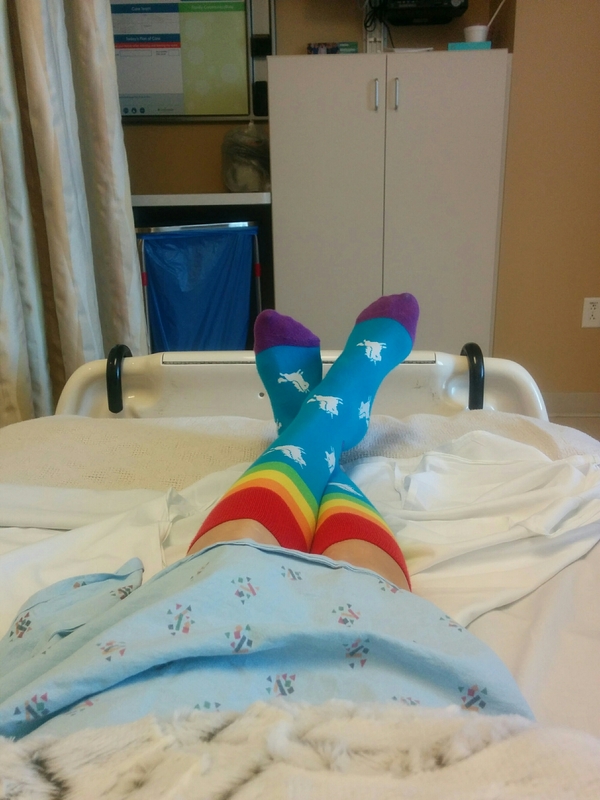 Love the socks…your amazing attitude…and you! All you need is a unicorn and you’d be set! Thinking of you today! You are such a trouper!